West Windsor, NJ – The lightweight pair of Kyle James and Jack Gleim of Princeton National Rowing Association’s Mercer Rowing Club won a gold medal in the Under 23 category at the 134th Royal Canadian Henley Regatta, the premier summer event for rowers in North America. The victory at Henley marked the pair’s first international win. 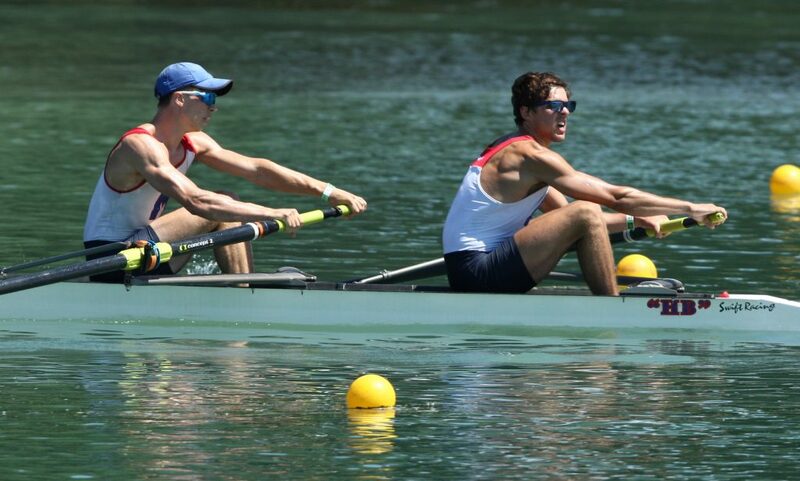 James and Gleim will represent the United States in the lightweight pair event at the 2016 Under 23 World Championships, August 21-28 in Rotterdam, The Netherlands. “We wanted to compete at Henley to work out the kinks before the World Championships, race more crews, have fun, and win Henley gold,” said James, who will be a senior at the University of Wisconsin-Madison. Gleim will be a senior at Marietta College in the fall. The pair won by more than three boat lengths with a time of 6:48.28 in the 2,000 meter race. Gleim appreciated the learning opportunities provided by the progression from the heat to the semifinal to the final at Henley. “In our heat, we went against the plan we had set with our coach and switched our oar clams at the starting line. This made our oars heavier than needed and as a result, we didn’t get a rhythm going in the headwind. In the final, we stuck with our plan and our coach’s advice and had a much better race. At Worlds, I’ll be sure to have complete confidence in our plan and preparation,” said Gleim. James and Gleim rowed together at PNRA/Mercer during their years at Princeton High School and West Windsor-Plainsboro High School South respectively but hadn’t rowed together for three years before reuniting to train with Coach Skip Kielt as part of PNRA/Mercer’s Under 23 Summer Rowing program. Gleim was the catalyst for the creation of the pair. Determined to find a pair partner to make a long-shot run at qualifying for the World Championships, he had his former PNRA/Mercer teammate high on his list. The two had rowed together in a varsity 8 with coxswain in the Grand Final of the 2012 USRowing Youth National Championship Regatta. “Jack called me in February and suggested that we try to qualify for the World Championships as a lightweight pair, and I turned him down!” said James. Gleim did not give up on James, though. By May, James had recovered from an injury and was preparing to compete at the Intercollegiate Rowing Association’s National Championship Regatta in Wisconsin’s lightweight 4 with coxswain boat. “I changed my mind and committed to row with Jack. In college, you train so much and race just a little. There are more opportunities for racing in the summer.” One of those racing opportunities was the 2016 Under 23 World Championship Trials on July 18 -22 at their home course in West Windsor, NJ where the pair’s enthusiasm for racing resulted in victory and the opportunity to race again as representatives of the United States. James and Gleim are in the process of fundraising to help cover the costs associated with competing at a world championship. More information is available at nrf.ralleyme.com.